I woke up bright and early on my second day in Hong Kong and decided to have breakfast at Tsui Wah, a Hong Kong style cafe chain recommended by Janice. Apparently the regular menu is not available before 11:30 am, so we were out of luck because we weren't interested in any of the breakfast items. Our waitress seemed clueless about everything, but at least she was helpful in the sense that she would help us ask other staff. We asked if the crispy pork chop bun ($34 HKD ~ $4.58 CAD) was available even though it wasn't part of the breakfast menu, and she found out from the kitchen that it was. Lucky! The bun was a very soft and fluffy Portuguese style bun with super tender pork chop slices inside. The burger was lacking in flavour due to a lack of sauce and seasoning, and the fries were soft and mushy. But since the pork was fried nicely, this was still a satisfactory dish. 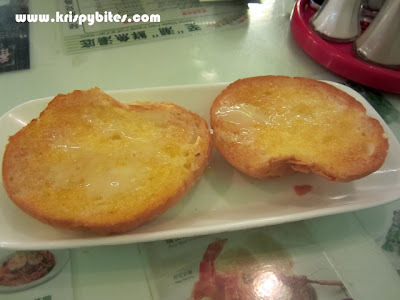 I think Janice specifically recommended the crispy bun served with sweet condensed milk, and how lucky for us that it was cheaper during breakfast at only $10 HKD ~ $1.35 CAD. 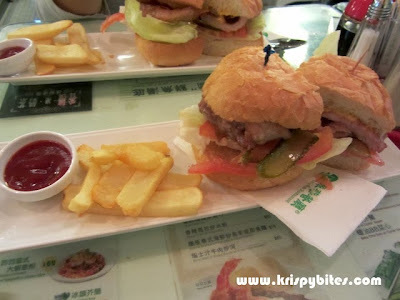 It was the same fluffy Portuguese style bun as the pork chop burger, but with a topping of butter and condensed milk. 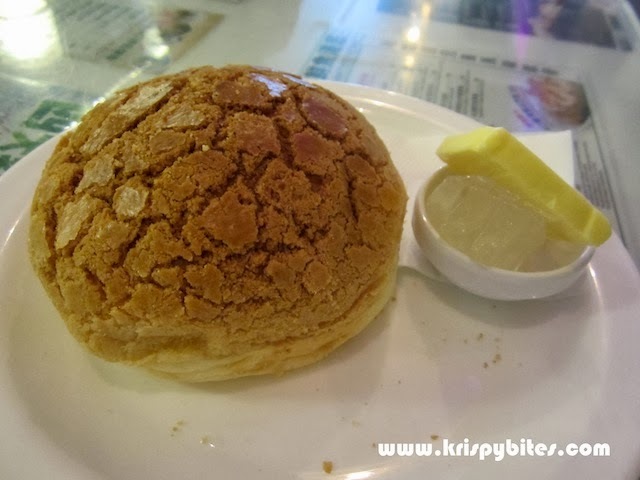 I think the most disappointing was the pineapple bun with iced butter ($10 HKD ~ $1.35). It was a different pineapple bun than the kind I'm used to. The flaky buttery crust on top was completely soft and not crispy or crunchy in any way. The bun was barely warm and did not make a good duo with hard iced butter. And apparently Tsui Wah's prices are quite high in Hong Kong standards. Considering the food is not that tasty either, I doubt I'll be coming back. Other locations might have better food, but I don't really care to find out. What were you supposed to do with the iced butter??? You're supposed to cut the pineapple bun sideways and put the iced butter slab inside. Most people also like to sprinkle some sugar on the butter. The cold butter is supposed to contrast with the warm bun, but I like it the traditional way in which the butter is room temp. Also I like the traditional pineapple bun with a crispy topping instead of a soft mushy topping.